Google AdWords and Microsoft’s Bing Ads both work from a similar auction-style model. There are limited ad slots and users bid for top slots. The highest qualified bidder (more on this later) will get the top slot. Interestingly enough, SEM is tied directly into SEO. We’ll get to that later, but first, let’s define SEO. For SEO, the “O” may as well stand for “onsite.” That’s because what you do on your site determines how search engines read and rank your website. As before, SEO is significant for all channels, including mobile resources. The quality of a keyword is determined by multiple factors that are simultaneously simple and complicated. Google and Bing read your site, index it, and determine how effectively you provide an answer to someone’s search engine query. It’s a basic concept, but SEO is a complex and ongoing challenge. Search engines survive by providing you with the right search engine results. Since search engines also live and die on their income, they want to provide the right ads. There are industries that can outbid other businesses, so Google was the first company to limit top advertising slots to the best pages. In fact, there are times were Google will not even let certain unqualified websites from advertising at all. In an time where every website is chasing the same dollars, it seems counterintuitive that Google would turn down any income. And yet, it works. The ads are often so well qualified that you may get a better result from an advertiser than from an organic result. Some marketers and content strategists sniff dubiously at the idea that an ad can work, but sometimes ads are the best result for a search query. If a user is looking for a business or product that solves their problem, it may be a well placed ad from Google AdWords that gets them there. In fact, anytime I am developing a strategy for a brand, I’m hoping that the prime competitors are naysayers of SEM. If there’s less competition for keywords, my limited budget is going to drive more leads. Organic search results have benefits and challenges that SEM can help solve for brands and for potential customers. That was a simple way to explain the relationship between The Dynamic Duo of Website Traffic: SEO and SEM. These tactics are both important for modern website creators, brands, and marketing teams. Many modern teams stop short at leveraging SEM. They believe (usually incorrectly) that SEO will be enough to drive qualified users to their website. At one time, this may have been true, but the web is actually a dynamic channel, and things change all the time. SEO is incredibly important and it requires ongoing maintenance. It’s not a trivial effort that you “set it and forget it.” Google is constantly tweaking their algorithms to provide better results to…well, us. That means they must evolve their results to reflect the thousands of new content resources that are published every day on the web. Your website may have been the best resource for a particular piece of content yesterday, but it may not be the best resource today. SEM is important for different reasons. If you do a keyword search in your category (not specifically for your brand name), count how many results Google displays. If your brand doesn’t come up on the first page, you may want to consider how a few hundred dollars can elevate you to the top of the search engine results page (SERP). It may actually be a few thousand dollars a day, depending on your category, but you have to consider all the people and companies bidding on important keywords. If it’s a significant “battleground keyword” that you have to win on, you may have no choice but to invest advertising dollars into SEM. 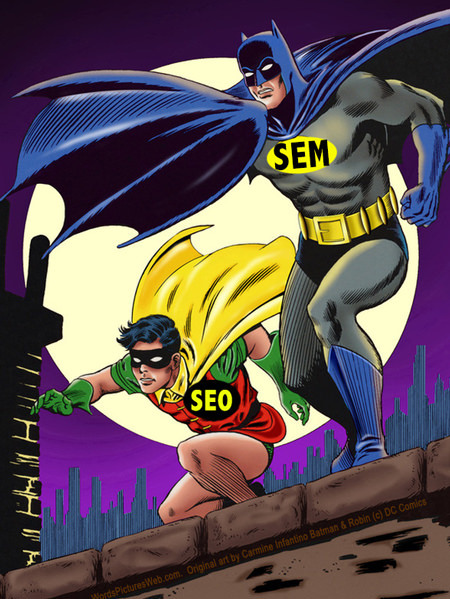 SEO and SEM are a dynamic duo for your business. Digital channels are constantly changing. If your business depends on getting qualified users to your website, SEO and SEM should be in your tactical toolbox. This was a rather basic view of two complex traffic-driving tactics. I hope these simple explanations and links give you a good starting point for ongoing research. Remember, these SEO and SEM are dynamic tactics. The techniques that work today may not be effective next year. That means you need to devote time and resources to ongoing optimization for your SEO and SEM campaigns. Below are additional links for your ongoing research. This entry was posted in advertising, content strategy, Content Strategy Basics, Google, Microsoft, SEM, SEO, technology, Web Design and tagged advertising, Adwords, Basics, Bing, dynamic duo, Google, Marketing, Search, SEM, SEO by Buddy_Scalera. Bookmark the permalink.